If you heard of Traveler’s Tales, then you probably know it as the company behind the infamous LEGO videogame series… And yes, they are back with yet another edition (the 28th if our math is correct), this one called LEGO DC Super-Villains, a spin-off to the LEGO Batman Trilogy. Despite the Lego formula being tired at this point, Traveler’s Tales manages to make the best out of their DC license deal, ending up with a charming quirky videogame that keeps you entertained throughout the story, and overshadows its faults. As a person who’s never played a Lego game prior to this one, I found myself oddly fascinated by it and encouraged to go back and give the other games a chance. The comic-like characters, humorous atmosphere and the ability to customize your character for the first time in the Lego universe adding to that an interesting story kept me glued to the screen for hours. You get to play as a villain, however, you can totally switch to different characters you unlock throughout the game, ending up with an array of villains you probably recognize like The Joker, Livewire, Harley Quinn, and Lex Luthor. LEGO DC Super-Villains offers you the chance to play some of the most popular evil-doers in the DC and LEGO universe, and the ability to customize them, making it loads more fun. I’ve always been a fan of villains in comics more than superheroes themselves, especially in the DC universe, who have the deepest and most complex supervillains in history. In LEGO DC Super-Villains you are an asset to Darkseid, the evil lord planning to annihilate the universe. However, here’s the twist, the justice league has vanished, and they’ve been replaced by a so-called group of heroes called Justice Syndicate, who are actually villains responsible for Justice League’s absence. You play as the rookie who’s in the process of getting transferred to Ryker Island, under the watch of Commissioner cordon, our favourite Batman ally. Unsurprisingly, you earn your freedom along with Lex Luthor with the help of Mercy Graves; the assistant of Superman’s archenemy. The story goes on from there in a simplistic but fun, mood-elevating and humorous plotline that’s assisted by jokes that had me laughing for a couple of minutes, there. LEGO DC Super-Villains has fairly easy gameplay, in fact, combat is very simplistic. Despite being able to change characters, the combat and moves remain the same, making the game, at times, boring and repetitive. You encounter a lot of puzzles along the way, which are no hassle, unlike the Riddler ones in Batman: Arkham Knight which I admittedly struggled with. If you were worried about tiresome puzzles, scratch that out, LEGO DC Super-Villains’ puzzles do not pose a threat. What’s amazing about LEGO DC Super-Villains is the fact that you can roam around Gotham city, metropolis, and central city in its vast open world. The story actually has loads of content that’s about 10 hours of storyline and overall 12 hours to complete. On top of that, the game shines in its spectacular voice acting thanks to the reclamation of Kevin Conroy, Mark Hamill, Tara Strong and Jennifer Hale of their characters in the DC Universe. 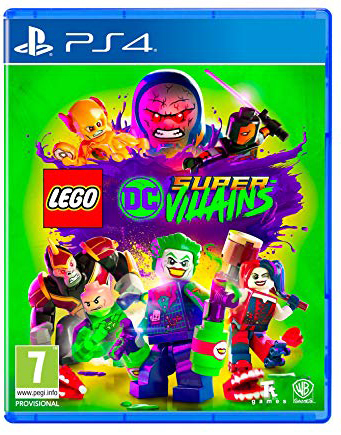 LEGO DC Super-Villains was reviewed using a PlayStation 4 digital download code of the game provided by Warner Bros Games. The game was is also available on Xbox One, Nintendo Switch and PC via digital and retail store releases. We don’t discuss review scores with publishers or developers prior to the review being published (click here for more information about our review policy). LEGO DC Super-Villains presents a humorous interesting story that shines in its amazing soundtrack and voice acting but falters in gameplay. The game, although bringing along interesting villains does not present anything new, and yet again we are reminded that the Lego formula has been overused, however fans of previous games will surely love this twist.